A few weeks ago our school’s basketball team played their final game of the season. It was one-and-done time in the district tourney and we were done. The team had a incredible run, setting a school record for wins and beating some great teams, so it was a bit emotional to see it come to an end. That and the fact that team had seven seniors playing in their last game. 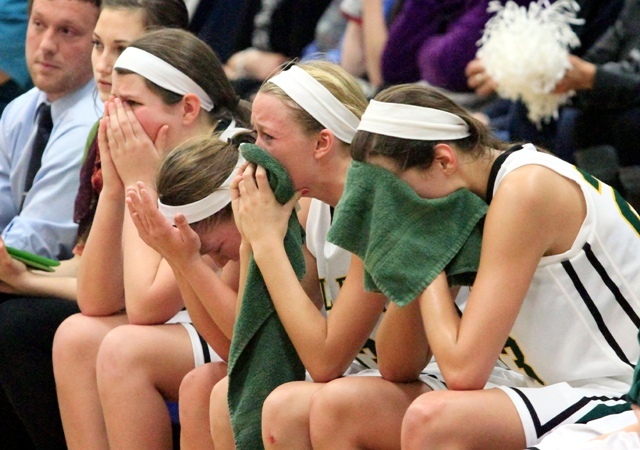 They sat on the bench in tears watching the final minutes tick down. But it wasn’t the loss of that one game they were mourning. They were mourning the end of a season and, in some ways, the end of High School. When they came out of the locker room the tears had spread to the entire team and they were all crying and hugging the seniors. I wonder if God sometimes looks at our grief in the same way. He smiles at our tears. Not because he’s insensitive to our hurt but simply because he knows something even better awaits. We stubbornly cling to this life as if we’ll never have deeper friendships or better times than here. Not unlike my adopted son who refused to let go of the orphanage worker while his parents stood with open arms waiting to take him home.